The Shenandoah National Park raised relief map is done at a scale of 1:250,000 thus 1" = ~4 miles. Available unframed or framed. 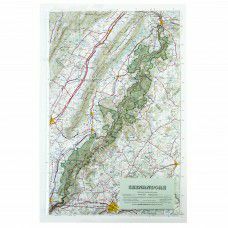 Makes a great display map of Shenandoah National park and part of the Blue Ridge Mountains. Item Number Size / Frame Options Price Qty.